At last my Trigon has arrived. It came on Friday evening, although I've been too busy tackling the fireplace to post pics etc. The tank was too tall to take a single picture of. 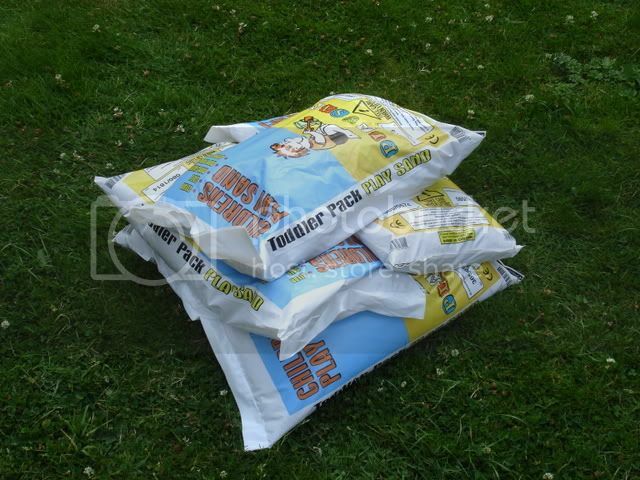 Yesterday I then went to Argos, and bought 5 15kg bags of play sand, which had to be washed. It took 2 hours, but should be worth it. As I had taken the Fluval 405 apart, I discovered that the ceramic shaft that the impellor sits on has broken, so a new one will be bought when I go to the lfs to get some boulders. Today the walls where the fireplace was need to be painted, but since it's emulsion hopefully it should dry quickly. I'm going to be getting the boulders and replacement part for the Fluval 405 today. 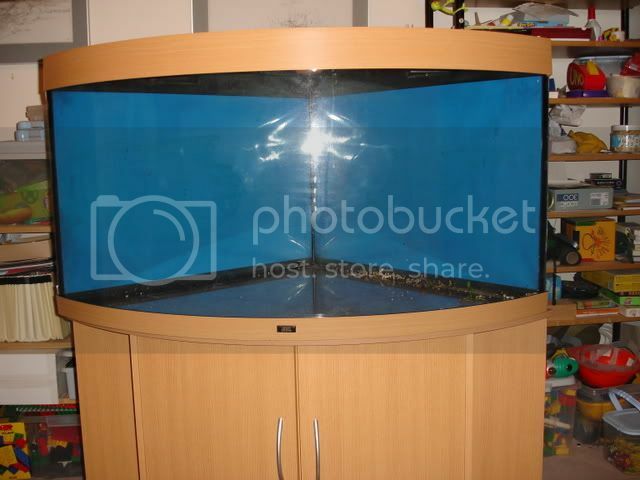 I've been cycling the filters (the 405 and an Ehiem 2217) in a plastic box, which means that I can add stock to the tank as soon as I like, which will hopefully be tomorrow, when Becky brings down Filip the plec and some Mbuna from Wharf. I'm then going to get the rest of the Mbuna from my local Maidenhead Aquatics, and a breeder in Luton, who has very good prices. Last edited by alip01 on Thu Apr 30, 2009 4:11 am, edited 4 times in total. A friend of mine has the same tank and they just look lovely with the depth view they give..
His fish seem to love it as well..
Looks like you got yourself a bargain Alistair! Will this have cycled the filters adequately? I don't know exactly how you've done it but presumably your plastic box is a lot less than 350 litres. Let's say it's 50 litres, that would mean 4mg/l ammonia per day in the box would only be the same amount of ammonia as about 0.6mg/l in the tank. Plus you lose any bacteria that are on the box walls rather than in the filter. In theory there's plenty of spare capacity in a tank cycled to 4mg/l and I think you'd be OK if you didn't fully stock it straight away - just worth some caution though? Could you get the filters in and check the cycling in the tank for a few days with the full 4mg/l? I am going to do that, and only add half of the stock or so. Went to the LFS this morning, and got lots and lots of rock, a new 300W Fluval Tronic heater, and some pellet food. 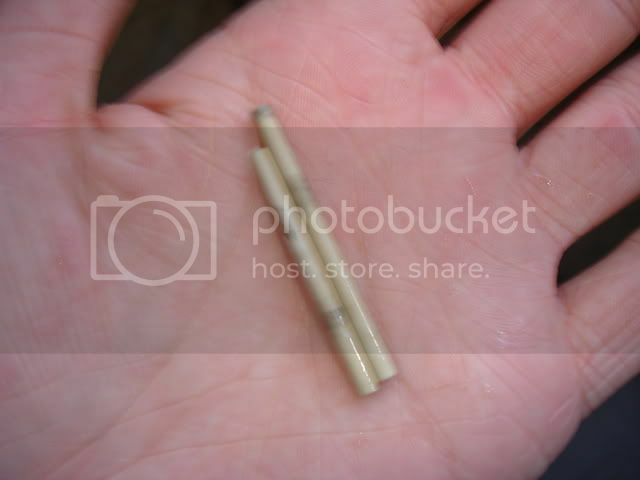 They didn't have the spare impeller shaft I was after for the 405, just ones for the 404 which they said wouldn't fit the 405, but after a Google search seems to fit the 405 as well. They said they could order one but I decided it would be easier to get it online... so it looks like I could have got it earlier today. 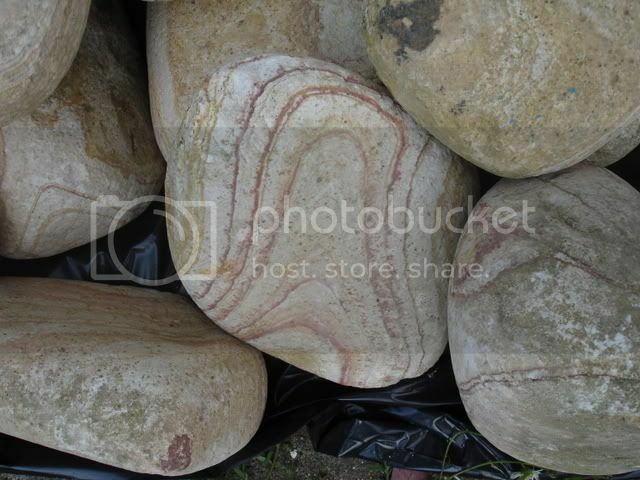 The Rainbow rock boulders and the pebbles are in the bag. 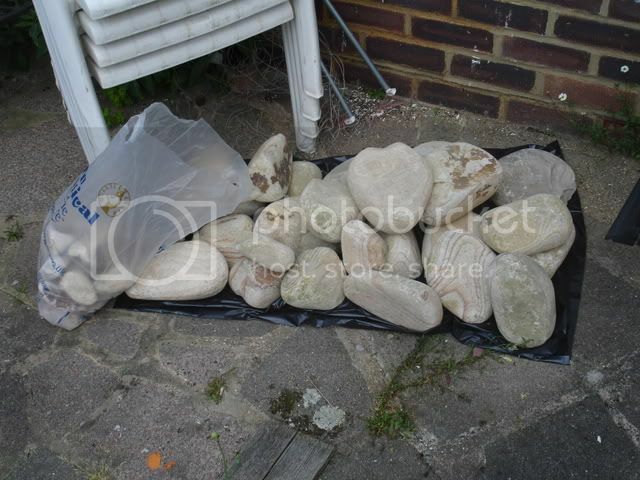 The boulders were Â£2.99 each, and the pebbles were only 75p/kg. As an added bonus, the scales they use to weigh the rock etc. were broken, so they under estimated, meaning I got a couple of kg of pebbles for free. A close up of one of the rocks showing the contrasting strata that the rock has. Last edited by alip01 on Thu Apr 30, 2009 4:12 am, edited 1 time in total. I've been washing rocks for most of the afternoon. They seem to be colouring up really nicely. I'm fairly confident that the 404 shaft is the same as the 405's, since most of the websites that are selling them say 304/305/404/405. So I'll just get it from the cheapest website I can find. The 405 does work with it snapped, so it's not a matter of urgency, but obviously it would be better to have it sooner rather than later. Alistair, do you know of many breeders in the Luton/Beds area? I've only found two Rift Lake cichlid breeders in the area. This one and this one. 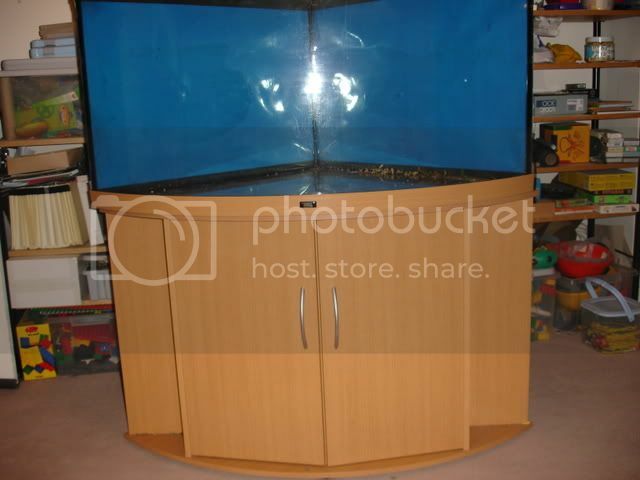 I found them via looking in the Aquarist Classified areas for Beds. and Herts. I'm going to be using the first one because they have more fish I'm interested in getting. Ah right, they're for rift lake cichlids. Since we have hard, alkaline water around here, it's unlikely that there will be Apisto. breeders around here, since Apistos breed in soft, acidic water. If you're just getting a few Apistos, I'd just get them from the lfs, but I'm not saying there won't be any breeders around here. Just to let you know I got my Blue Dolphins from Tony Harris. He has a really good set up. I was talking to him for hours. For the cheaper fish he sells they will be under 1cm. As this is a new set up you should be ok. He gave me some really good tips on food ect. One or two things I don't agree with but every one has there own was of doing things that works best for them. I have often seen the other guy advertise but I have never been able to get a hold of him. If you get to look at his set up could you let me know what its like? I never buy any fish with out seeing how they have been kept and I'm not sure if he would let me come to look around (Well his ebay listings points in this direction). Oh and I love the rock. 60 + 70 ltr Maternity Tanks. /sigh the things we do for are loved pets. I've emailed the other guy to ask when he has collection dates because he's not put them on the website. He's replied, so it looks like I'll be going round when I've got the tank set up. I'm not going to be getting Blue Dolphins, since I feel they'll be too big for the tank and the other fish. Filip has made it down safely.